In 2011, the Wisconsin budget crossed a line — literally and figuratively. For the first time, the state allocated more money to the Department of Corrections than to the entire UW System. Prior to 2011, the UW System had long been one of the top three recipients of state funds, after K-12 schools and medical assistance programs, such as Medicaid, but in the 2011 biennial budget, the Department of Corrections surpassed the state’s public universities, making Wisconsin taxpayers’ number three priority the prison system and correctional facilities. A survey conducted by the Vera Institute of Justice estimated that in fiscal year 2015, the State of Wisconsin spent about $38,644 per inmate per year — about 22 percent more than the national average. Conversely, the National Center for Education Statistics released a report estimating that Wisconsin schools spent about $10,897 per student per year — less than 30 percent of the spending per inmate. The return on investment in prison systems is a little bit more complex. While prisons do not generate any tangible revenue, there is a significant value to be placed on public safety. This is very difficult to quantify, but its importance is not to be discounted. It is, however, difficult to disaggregate investing more money in the prison systems from increased public safety. According to the Public Safety Performance Project, from 1990 to 2012, the Wisconsin state legislature increased spending on prisons by 620 percent. The increased spending in 1990 was a direct result of Governor Tommy Thompson (R) and the legislature’s desire to crack down on non-violent crime, particularly drug-related offenses. The state also worked to implement Truth in Sentencing. In that decade, the state spent money building additional correctional facilities to accommodate a growing prison population, which increased by over 200 percent from 1990 to 2014. Crime rates have been steadily decreasing over the past several decades, and one could argue that the reduced crime rate is a direct result of the increased spending on the DoC. However, according to data on violent crimes from FBI UCS Annual Crime Reports, rates of violent crime in Wisconsin had already started decreasing by 1980, and with the increased spending on prison systems that began in the 90s, the rate of decrease did not change very significantly. This would suggest there is not a significant correlation between increased spending on prisons and decreased violent crime rate. This shift that occurred in 2011 calls into question the priorities of our state, and our society. Are we going to prioritize the perpetuation of institutionalized racism and a class system that traps people of color and lower income citizens just to mitigate our own prejudicial fears about other people? Or are we going to prioritize encouraging a new generation of learners, creators and innovators who work to participate entirely and meaningfully in our society? We should be providing at-risk youth a promise of quality post-secondary education, not investing in departments that reinforce systems of fear, poverty and discrimination. The prison-industrial complex is a pervasive system of institutionalized racism that traps people of color into the omnipresent cycle of oppression perpetuated by inequality in the justice system, as well as income inequality, job discrimination and other oppressive power structures. According to a study conducted at the University of Wisconsin – Milwaukee, Wisconsin has the highest rate of incarceration of black men: 12.8 percent of black men in Wisconsin are incarcerated, compared to the national average of 6.7 percent. Similarly, the incarceration rate of Native American men in Wisconsin is 7.6 percent, as opposed to the national average of 3.1 percent. Politicians often argue that the UW system can handle budget cuts better than other departments because it has other, significant sources of income (i.e. tuition), while low-income public schools and correctional facilities do not take in the same amount of money from its users. 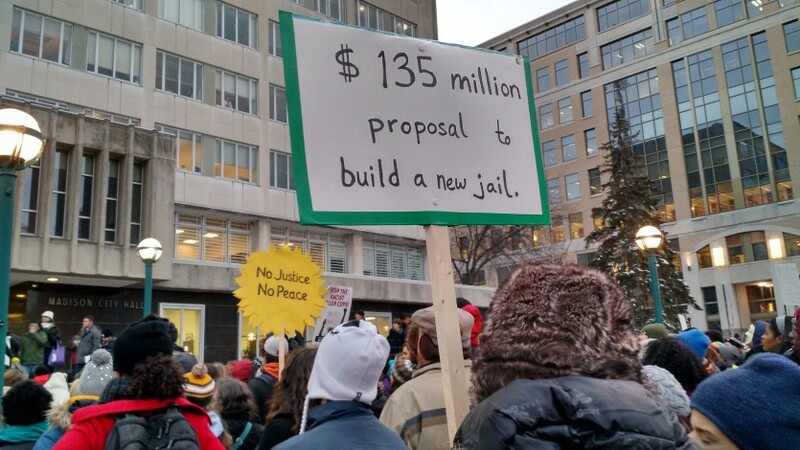 While it’s true that the UW system does budget for around $5 billion in program revenue, as opposed to the approximately $120.4 million in program revenue budget for in the Department of Corrections, the heavy reliance that the state places on UW’s tuition and fees from students and their families means that the higher education system is becoming increasingly inaccessible. Even with the tuition freeze placed on the public universities for several years, increases in student segregated fees, student housing and other non-tuition related costs are causing the cost of attendance to continue to rise. Investing in education encourages the mobility of money amongst classes and helps minimize economic disparity by spreading the money around. Investing in the prison system pushes more money into the hands of a few, while funding the perpetuation of the gap between lower and higher income Wisconsinites, those who have the resources to attend university, and those for whom postsecondary education is not a realistic option. We need to recognize the power of investing in things that benefit the masses, because in the end, we will all benefit from a more skilled workforce more than we will from a higher prison population. Cait Gibbons ([email protected]) is a sophomore majoring in math.